The genesis of this post goes back to the end of 2006 via a longtime AD reader (Sean Howe). If you’ve been around a minute you may remember L.A. Burnout from January of 2007. As I mentioned a couple of years ago, these are the tunes I was spinning while reading both Laurel Canyon: The Inside Story of Rock-and-Roll’s Legendary Neighborhood and Hotel California: The True-Life Adventures of CSN, etc. 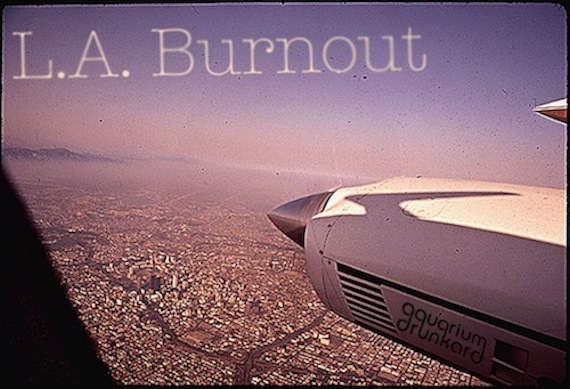 L.A. Burnout is made up of the sounds floating around Los Angeles in the late ’60s and ’70s; a faded aural imprint of the canyons, beaches, wildfires, neighborhoods, late-nights and early mornings of a bygone L.A. Play this mix around dusk while driving through Topanga with the windows rolled down – it’s the next best thing to time travel. Grab it after the jump…. Thomas Jefferson Kaye :: L.A.
Also: We (Mondo Boys) are working on the follow-up to the WEIRD SUMMER mixtape – look for it next month. In the meantime WS is still live on the blog and available here. one of my favorite AD posts- thanks for reposting! Good stuff….thanks for recognizing the great Gene Clark. In october I’ll be showing some friends around L.A. before they go see U2; you can bet this will be playing while we inevitably sit in traffic on the 110 downtown. Wow– Thanks so much for this! Let’s see how it works for midcoast Maine! No WIld Lights “California on My Mind”on the list? wicked mamma cass doing john hartford. Its more than a little imagination, but its effect is hardly subdued in Nebraska. Just finished reading Thomas Pynchon’s Inherent Vice. This playlist goes perfectly with it. Best place on the Internet, period. Thanks AD. did micky dolenz do a solo album? where is the ‘beverly hills’ track from? can’t wait to listen to this. i wore out weird summer almost! I love how Sweet Joni leads into a Joni Mitchell song. Perfect. Indeed, I’ve been listening to this nonstop since yesterday. Totally dig Eddie & Flo and the Mickey Dolenz songs. Keep it coming with the mixes. thanks again for reposting. i remember when you first wrote about the dennis wilson album, too, before the excellent officially released double album. Excellent compilation! I made one myself a few months ago with the same theme when I went to see my sister in LA. We shared some of the same songs and you turned me onto some I was unaware of, thanks! Its hard to have one compilation with all the great LA themed songs out there, you could probably do a whole series of comps based around LA alone, good work. How about “Los Angeles” by X. Thanks for the Albert Hammond though. Merci AD, best site on the net. oh man neil young really nails it when he nails it. Having never travelled to the west coast of the United States, L.A. is an abstraction for me: a city of the imagination informed exclusively by pop culture (as well as dalliances with the output of its musical underground during the fertile years of the late ’60s and ’70s); a tapestry of Pynchonesque simulacra stroking the strings of my unconscious. The Doors are among the groups that have always provoked a visceral connection to the city for me. Given that their sounds were floating around amidst the formidable offerings presented here and that their material embraces the spirit of the compilation, I would be inclined to find an opportunity to include them. Naturally, the too-easily recognisable pillars from their opus wouldn’t sit well here. Perhaps Krieger’s “Runnin’ Blue” (Soft Parade, 1969) would be the best candidate? Great compilation – I have enjoyed it immensely. Perhaps you should have thrown in Randy Newman, “I Love LA” but you could also go on adding songs. Love your work – it keeps me coming back. L.A. Getaway by Hill, Barbata & Ethridge needs to be aded to this. woooooo looks great wheres the link for download i cant seem to find it…..cheers….. It appears the link has disappeared – is there any chance you could repost this as it looks truly amazing. Heading to Los Angeles this weekend, I need this comp! Please repost! Is this compilation still available for download? I’m not seeing a link. Thank you! please repost la burnout or email me a link, thanks! Wow, this looks like a fantastic compilation. Too bad the link’s gone. Guy Clark burnout track, really cool. and i really was interested in hearing it, too! Thanks for reupping this. Great mix. Oh, man. “Desperadoes Under the Eaves” is my favorite song of all time. What a song. What a mix.